To start this off I sketched my design out on graph paper so I had a good starting point. I then used the formulas that where given to create my drawing. I used a total of 56 equation to create this drawing. I think this was fun but very time consuming to make something to the size that you want and how you want it. Over all I think this was a very fun project, and it helped me understand graphing a little bit more. 1. What content/ skill have been the most interesting to you? I feel like one skill that I actually enjoyed learning was using the TI calculators. I think i liked learning this because they are easy to use and they can make things easier to do when the calculator does all the work for you. 2. And How has this content/ skill helped you grow mathematically? 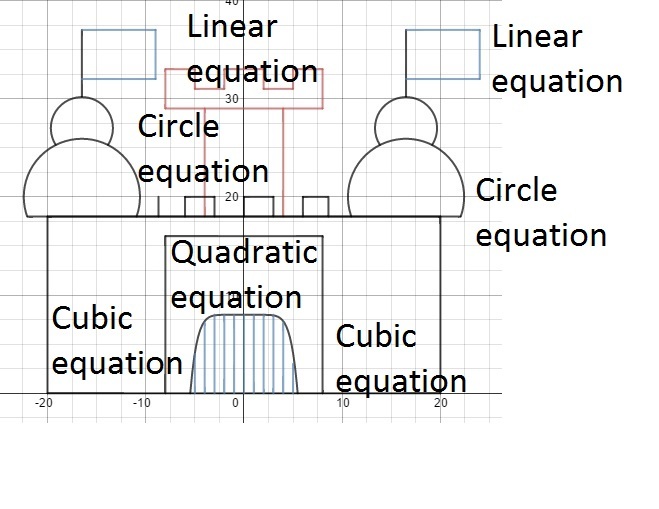 This skill has helped me grow because before I would had to of made a table and chart and do all of the calculations to find answers when all I need to do is enter what I know in the calculator and I can get it from it making it faster and more accurate than if I do it because I am a human, I make mistakes. How have POW's helped you grow mathematically? This year I think that the POW's have really helped me because they made me think outside the box and they challenged me. I think one of my favorite POW's was the soda can POW, I liked it because I did it a way that was way different than everyone else's, I used excel and everyone else used charts, tables, or graphs. I think that the POW's were a great thing to do and think that we should keep doing these at Animas. We where asked to answer some question about unit 2 and reflect on them. 1. What has been the work you are most proud of in this unit? I think that the work that I am most proud of would have to be my _______ Because I tried my hardest and learned a lot from it. I really put my effort into this. I think that i should start putting all of my effort into my work because i feel like i am trying my hardest and i should push myself to do my best. 2.What skill are you learning in math/geometry? I think that I learned a lot when we where learning how to use a graphing calculator because I didn't know how to use it at all. I still could learn a lot because we didn't really spend that much time on it but I learned a lot when we did. 3. Choose one topic: similarity (ratios) or trigonometry. Explain what it is. Provide an example of how it is used in mathematics to solve problems. state an application of the topic in the adult world that interests you. Trigonometry has multiple real world applications in it. I think that i would like it because becoming like a ballistics personal, finding the trajectory of the bullet .I think that becoming a ballistics personal would be really interesting to figure out how far and high they were from the target. 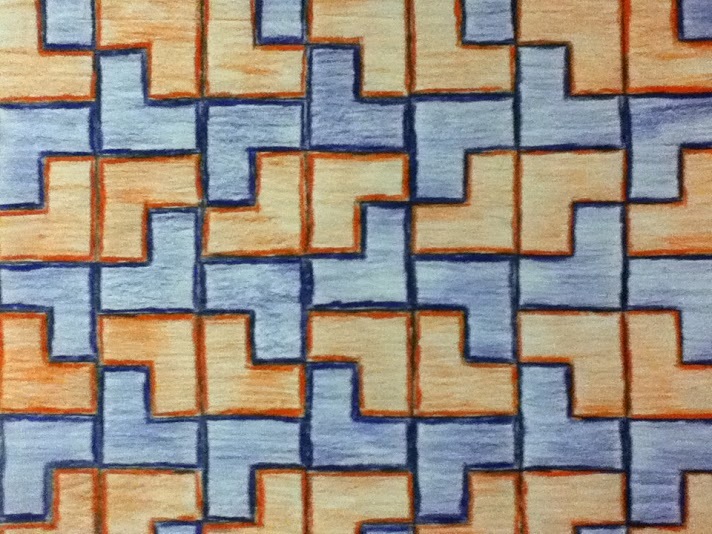 To make my tessellation take a sheet of paper and cut out an even square. Next you will take the square that you cut out and cut exactly one quarter of the square. Now you have the tessellation that I used to create this tessellation. line and then to another point. " Question 1: Once you have a minimal path, what appears to be true about the incoming angle and the outgoing angle? When you get the minimal path, the incoming and outgoing angle are approximately the same. Question 2: Why is the path from points Camper to Tent Fire' the shortest path? This is the shortest path between the camper and the tent, with a stop at the river, because the two distances are [theoretically] equal. Question 3: Where should the point River be located in relation to segment Camper to Tent Fire' and line AB so that the sum of the distances is minimized? The River should be placed directly in the middle of the Camper and the Tent because when the two distances are equal, than it decreases the time to go that distance. The geometry concept used to create this design was reflectional symmetry. all of the lines are repeatedly reflected onto each other to make the design. when you move point D you see lots of reflections happening. I really enjoyed this project because i really like making cool designs such as the one above. I had fun learning to use the program Geogebra to make it also. I learned that this is harder than it looks but it was a fun Geogebra lab.